Tonight on NBC their drama Chicago PD returns with and all new Wednesday, October 26, 2016, season 4 episode 5 and we have your Chicago PD recap below. On tonight’s Chicago PD Mouse (Samuel Hunt) contemplates reenlisting in the Army and Platt (Amy Morton) informs Tay (Li Jun Li) about her next assignment. 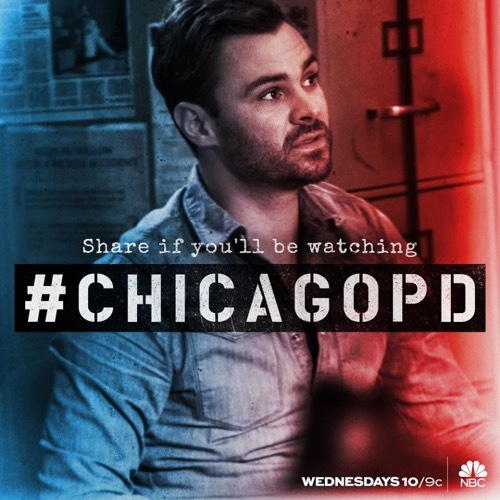 Did you watch last week’s Chicago PD season 4 episode 4 where when a car plowed through a crowd of concert goers and gunfire erupted, Lindsay (Sophia Bush) and Ruzek (Patrick John Flueger) were on the scene? If you missed it we have a full and detailed Chicago PD recap from last week, right here! Chicago PD starts tonight with Dts. Halstead (Jesse Lee Soffer) and Lindsay (Sophia Bush) arriving at Chicago Med when Dt. Halstead’s brother, Dr. Will Halstead (Nick Gehlfuss) calls them in after they are on their third wave of heroin-laced with fentanyl ODs come into the ED. Dt. Halstead said he will call into narcotics to see what they know. Lindsay asks if she can see the paperwork, Dr. Halstead tells her it won’t help; the calls are coming in from all over the city. Halstead mentions that it’s not a good idea for Craig “Mouse” Gurwitch (Samuel Hunt) to enlist again, but is quickly interrupted by a child’s scream. There is a body in the water, and when they flip him over, his face is bashed in. Sgt. Voight crouches down and scans the lake for anything, while the others attempt to keep it together. Chicago PD’s Halstead and Lindsay go to visit the morgue, where there are rows and rows of dead bodies who died from fentanyl overdose. The coroner tells them the last two weeks have been insane. She confirms the cause of death on their DOA, is blunt force trauma, there was no drugs in his system, but now they have a tattoo to ID him by. Officers Kim Burgess (Marina Squerciati) and Julie Tay (Li Jun Li) are walking out the precinct when Sgt. Trudy Platt (Amy Morton) calls them over. She tells Julie that she is being transferred back to her foot beat. Burgess is furious that it’s because Tay didn’t give in to her superior’s sexual demands. Platt explains that he went over her and over the Union; since he’s a Commander, there is nothing more she can do; and she is sorry that this is Tay’s last shift at 21. Tay promises to fight it. Dt. Antonio Dawson (Jon Seda) asks Mouse if there is any news on the tattoo, he says it’s for a Grace Clariden, who was 14 and died of leukemia, Mouse gives him the folder, saying the mother’s information is on the bottom of the page. Antonio and Dt. Olinsky (Elias Koteas) knock on her door, and when she answers, she thinks they are there to evict her, but they tell her they are there about her son, Tyler. She confirms that is his tattoo and when they tell her he is gone, she lets them in.Antonio asks her if it’s possible her son was mixed up in some illegal stuff. He tells her that when they found Tyler, his backpack was filled with narcotics. She tells them he was in the military, and ever since coming home, he has had a problem with drugs. She shows them pictures Tyler had on his facebook, Antonio and Olinsky recognize one of the guys, Tony Chin; Mouse confirms there is all kinds of phone calls between these two at crazy hours. Voight tells Ruzek and Dt Atwater (LaRoyce Hawkins) to go find Tony Chin. Mouse shows Halstead a picture of Tyler and how close he was to the ‘action’ in Kandahar. Atwater and Halstead find Tony at his dorm, where he tells them he didn’t know Tyler, they only met at a party. He denies everything, and Ruzek tells him to cut it out, that they know the two of them were running ‘dope’ together. Tony quickly changes his attitude, and asks if it is okay to grab his wallet without getting shot. He hands them a card and tells them if they have any more questions, they can contact his lawyer. As Burgess and Tay are riding and talking about how they can fix this job situation, a young boy, Chase runs in front of their car covered in blood. He says his mom hurt his dad really bad. When back up arrives, they come in the front door, and the father is sitting at the kitchen table with a knife stuck in his neck. He begs them to help him and that he doesn’t want to die. Burgess comforts Chase, and asks him where his mother is, he says he doesn’t know. Burgess then asks the husband what happened and he explains they argued and she stabbed him with the knife, but when she saw the blood, she took off. He insists that Chase was napping when this happened, but he had to call his son because he couldn’t find his phone. He said Chase hugged him and then ran to get help. When Burgess says that Chase will be taken by DCFS, he pleads with her to take him until he gets out of the hospital. Mouse and Halstead are arguing about him relisting in the military. Halstead says it’s a bad idea, but Mouse says he can’t stand sitting at his desk, while Halstead goes out in the action every day. Halstead tells him to become a police officer, but Mouse says he was born to be a soldier, and he is willing to die as one. Ruzek interrupts telling Halstead that the dealer switched from lactose to fentanyl. Atwater is at the scene where the dealer is, scoping out the area, the rest watch. When narcotics identify one of the dealers, Ruzek goes undercover as a drug addict, with Atwater watching, once the sale is made, Atwater arrests him. Voight and Olinsky have him in interrogation and tells him he is responsible for 9 deaths so far. He asks what they are looking for, and he promises to help as long as they don’t touch any of his boys. He says the guy’s name is Scoop and he is white, and wears lumberjack shirts. He says he met with him at a mini-mart once, by the lake a couple weeks earlier. The store owner admits he had never seen the black dude before, but the white dude comes in every other week. The owner says he doesn’t know where he lives, but he knows where his boat is and he could show there were the slip is at. Antonio says maybe this wasn’t a murder, that this could just be a horrible accident. Lindsay returns to the morgue where she learns that the drugs they found at the lake is no fentanyl at all, that it is off by a molecule, and therefore isn’t what caused all those people to die at Chicago Med. Chicago PD continues with Halstead confirming that Tyler didn’t die from his face being bashed in, he was in fact, hit by the speeding boat. Lindsay comes in and explains to Halstead and Voight that the drugs they found is technically not fentanyl. Voight looks confused, and she explains that the manufacturers altered a molecule, so this stuff would not be on the US controlled substance list, but until it is activated, it is just basically baby powder. Voight tells them then they don’t even have a case. Burgess brings Chase into the precinct and Sgt. Platt asks him if he will watch the Chicago Blackhawks game for her, and keep her up to date on the game. She tells Burgess the mother is at a nursing class is done in an hour. Burgess and Platt agree that the mother must be crazy, and as she leaves class Tay and Burgess confront her. She is shocked that he would blame her for stabbing him, and that he always threatens to make sure he can keep their son, Chase. They arrest her. Olinsky comes to see Tyler’s mom, she brings him her son’s application to the Chicago Fire Department, and asks if they are sure her son was into illegal stuff. She tells him that if they can tell her he was turning his life around, it could give her some comfort; Olinsky says he is sorry but it looks like he is involved. Dr. Will Halstead comes to see his brother, Dt. Jay Halstead and tells him he needs to get this stuff off the streets. His latest patient who died was a 16-year-old girl, and he gives Jay the picture, saying it’s not just career junkies dying, that it’s also kids. Antonio finds out the boat is owned by a rich couple, who made a lot of money in construction. Lindsay says the couple is on vacation in Italy, so they didn’t take their boat anywhere. Olinsky says that their son, Scott, who goes by ‘Scoot’ attends school with Tony Chin. Voight tells Mouse to check the phone records between the three guys, and to bring Scoot in. When Mouse doesn’t respond or even look up, Voight confronts him in front of the whole team. Halstead says he will talk to him, but Voight tells him to do his job, but if he doesn’t want to be there, that is a different conversation. Mouse snaps that he only asked for a favor, and he has always done his job. Voight tells him to not “go out like this”, that he has come too far. Halstead and Mouse get into another argument about Mouse wanting to leave so bad for the military. Mouse finally admits that he looks at Tyler, and that could have been him, and still could be him. Lindsay breaks them up and tells them this conversation is done, that they are on a case and Mouse needs to go back to his desk. Halstead tells her he will get through to him; Lindsay says she is there for him if he needs help, but tells Halstead he needs to listen to Mouse. Halstead insists this isn’t the right move for him, but Lindsay tells him it’s not the right move for HIM; and Mouse going back isn’t the right move for Halstead! Lindsay says if he wanted to go back, would he let anyone stand in his way? Voight and Olinsky have Scoot in the room, where he has no clue why he is there. Olinsky tells him about the boat and damage on it. He says he was transporting marijuana, but Tony Chin thinks he is a gangster, whose Uncle, Mr. Walter Ing is the real deal. Tony tells his Uncle about it, and he pressures him to bring in fentanyl with the weed. Scoot admits that Ing hired these losers to carry the backpacks. Voight shows him the pictures, asking if those are the losers he is talking about. Olinsky wants to know what happened that night. Scoot tells them it was really foggy and he didn’t want to go that night, but Ing put a gun on the table forcing him to go. They ask him what he hit; Scoot says that Tyler was sea sick and leaning over the side, and he hit a buoy but didn’t know it was there until he clipped it. Voight tells him this is murder, and they can leave things out of the report, if he can help them bring down Ing. Scoot says he can’t go undercover, that Ing is a killer. Voight asks him how long he thinks he could live in Statesville? Platt is sitting with Chase, she tells him about her mother having anger issues too, and that he needs to know it’s not his fault. Chase says it’s his dad that gets real angry. Platt approaches Mouse and asks him for a favor, its illegal, but she needs to know if this kid is going to love his mom over lies the dad told. Halstead comes to see Mouse and tells him to do whatever he thinks he needs to do and that he will be behind him 100%. The Intelligence team puts the case together, and they are working to catch Ing in the act of modifying the fentanyl on Chicago soil. Atwater walks in and informs them that Ing will be doing it tonight, and Scoot acts too cocky, which annoys Voight. The team surrounds the factory, Halstead and Lindsay get into the factory from upstairs. Scoot arrives on scene, and is let into the place, the cameras show the buyers and the converted fentanyl, but no Ing. The team stops them from leaving with the drugs. Voight has Tony Chin in custody, but he denies anything. Voight tells him all the charges are going to be on him now, and tells them to haul him in. Voight leaves the scene and goes to see Ing, asking him why he would turn in his own nephew. Ing admits that Tony has had a drug and alcohol problem for a long time. Voight threatens him that if he pumps any more fentanyl into his city, they will be pulling him out of the river; when Ing answers sarcastically, Voight punches him in the face. Ing says he understands. Mouse finds something on the husband’s phone, and Platt asks for him to forward that to Burgess and Tay. She then hands him a paper to make his felony disappear so he could relist in the military. When he asks how she knew, she says Jay Halstead told her. Tay goes to Chicago Med to see the husband, and reveals that they know about the 17 google searches on non-fatal stab wounds on his phone. Burgess says it isn’t even possible for his estranged wife to even stab him like that. They tell him he is busted, and if he ever wants to see his boy again, now is the time to tell the truth. He says he did it because after 9 years of marriage, she left him for someone else. Burgess brings Chase out to his mother, and they explain that she didn’t hurt his dad. Chase asks who hurt his dad then, but the mother says she will tell him at home, and they need to go. Olinsky goes to see Tyler’s mom, and hands her an envelope of money and leaves. Tay talks to Burgess about what the Commander is doing to her and tells her to go after what she wants and never wait. Burgess goes to see Voight, and tells him that she wants to join his Intelligence team; and if the opportunity comes up again, it would be great for her to join his team. Voight tells her to be ready. She says she will and she is.